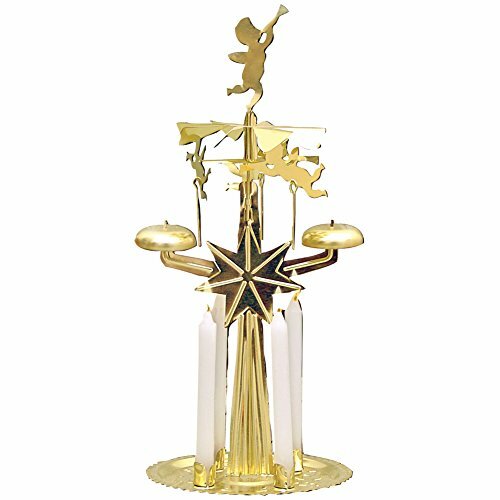 Relive nostalgic Christmas memories of the '50s with original Swedish angel chimes! You'll be captivated once again by the flickering candlelight reflected in the gleaming brass-plated metal, and the gentle movement of the angels and their delicate chimes. Includes four 4" candles with a burn time of 1.5 hrs. each. You'll be captivated once again by the flickering candlelight reflected in the gleaming brass-plated metal. If you have any questions about this product by Kurt Adler, contact us by completing and submitting the form below. If you are looking for a specif part number, please include it with your message.